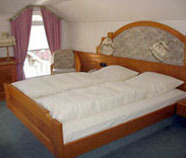 The cosy guest rooms in the hotel, some of them with balcony, are equipped with shower / WC, telephone, Sat TV and mini-bar. 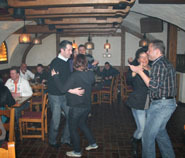 Relax in comfortable atmosphere in our Black Forest restaurant. Enjoy delicate regional specialities. A picture is worth more than a thousand words. Then how many words would the lots of pictures in our image gallery tell us? If you plan a short break or a longer stay, you will always feel home away from home with us here in the Northern Black Forest. Due to the mild climatic conditions of the foothill region, you will find the climatic spa “Bühlertal” in the middle of vineyards. The district town “Bühl” is located only 4 km from the hotel. Our hotel is rich in tradition and characterised by a familiar atmosphere and you will be assured of our attentive service at all times. 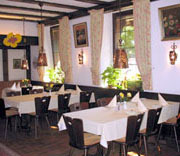 The well-known good “Baden region cooking” with many specialities or only a “Viertele mit Vesper” (a quarter wine with a snack platter) in a relaxing atmosphere is a culinary delight for every guest.